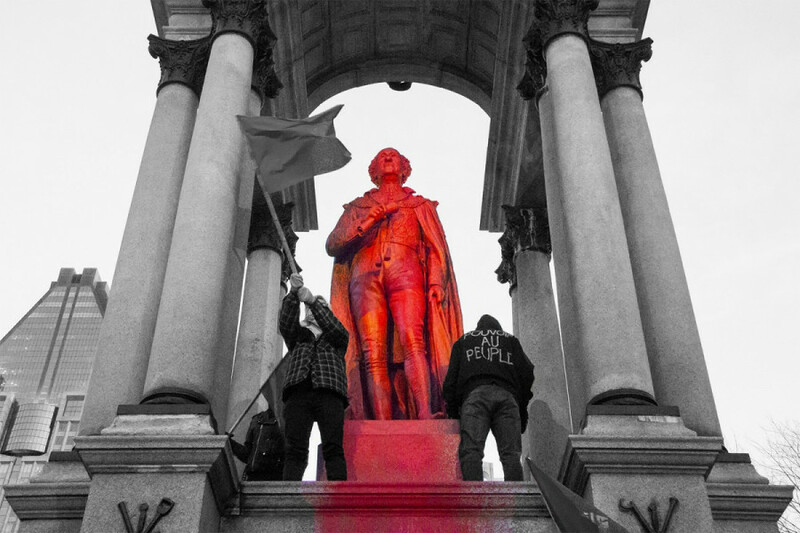 When a Montreal statue of John A. Macdonald was vandalized last year, cries accusing the vandals of “hating their country” and dishonouring Canada’s “founding father” could be heard across the country. To many, John A. Macdonald is not only Canada’s first prime minister, but the best one this country has ever had. He is the father of confederacy, without whom we would not be standing on this land today. He brought justice and order to our lands by founding the precursor to the Royal Canadian Mounted Police, our economy flourished and our resources connected through the creation of the Canadian Pacific Railway, and in signing the British North America Act, we became a nation of our own. What many do not realize however, is that Macdonald was also a father of genocide and starvation. He was racist, yes, even for his time. “Macdonald’s were among the most extreme views of his era. He was the only politician in the parliamentary debates to refer to Canada as ‘Aryan’ and to justify legalized racism on the basis not of alleged cultural practices but on the grounds that ‘Chinese’ and ‘Aryans’ were separate species,” writes Canadian historian Timothy J. Stanley. Macdonald’s legacy included a railway that spanned across the country, something he is still praised for today. In the early 1880s, over 15,000 Chinese men immigrated to build the railway. The men worked for $1 a day, and had to pay for their own food and camping gear. The white workers on the other hand were paid up to $2 a day and had their food and camping gear supplied to them. The more dangerous stretches of the track were allocated to the Chinese workers, resulting in many accidents and deaths. It is estimated that at least one worker died for every mile of track that was laid through the Rocky Mountains between Calgary and Vancouver. In “founding” the country, Macdonald signed the British North America Act of 1867, and created a nation on stolen land. This would lead to a nation of settlers, living on land that had belonged to Indigenous peoples for thousands of years, and to the oppression that continues to this day. Macdonald was one of the architects of residential schools, institutions that would bring trauma to Indigenous families for generations—trauma that continues to harm Indigenous communities today. While he may not have acted alone, and the problem continued long after his death, it does not change the fact that Macdonald was pivotal in the creation of Canadian residential schools. While his government had already enacted laws and legislation such as the Indian Act in 1876, which made certain Indigenous cultural practices illegal and forced them onto reserves, Macdonald felt that Indigenous cultures were not being eradicated quickly enough, getting in the way of the settler vision that he had for the country. He enlisted his friend Nicholas Flood Davin to investigate the success of assimilative boarding schools south of the border, which resulted in Flood Davin writing the infamous Davin Report, originally titled Report on Industrial Schools for Indians and Half-Breeds. Macdonald defended his decision to bring a residential school system to Canada in the House of Commons, and his reasoning is so disturbing, that I hesitated to even include the following quote in this article. From 1876 onwards, over 150,000 Indigenous children were ripped away from their families as part of a deliberate cultural genocide. For decades, children were forced to assimilate, not knowing their parents. To make matters worse, between 1942 and 1952, the government starved these children in order to perform experiments in malnutrition, and other medical experiments that some have likened to concentration camps. Some children even had health and dental care withheld from them, for the purpose of these experiments. The experiments were performed with the purpose of researching the effects of vitamin deficiency and gum disease in children. Residential schools were unfortunately not the only method by which Indigenous peoples have been intentionally starved. Many believe that Indigenous nations died out after confederacy because their immune systems were unable to combat the new diseases that European settlers brought over. While disease was part of the issue, Macdonald’s policies also led to the starvation of others. In order to make way for the settlers, Indigenous people were only to receive food rations if they moved onto reserves. Once on the reserves, some of those rations had been left sitting so long that they were rotten, leading to more sickness and death. This followed a similar model to the starvations of the Victorian Era, in British India and Ireland. As a response to the Red River Resistance of 1869 which established a Métis-led provisional government in what is now Manitoba, Macdonald created an oppressive military force that would set a precedent for the way in which law enforcement continues to treat Indigenous communities today. Macdonald created the North-West Mounted Police, a precursor to the RCMP, to bring “justice and order” to the reserves. It was this same military force that would back up the Canadian government during the failed 1885 North-West Rebellion. Towards the end of the 1870s, Indigenous tribes of the West were discontent with the Canadian government. Bison herds had disappeared, leading to further starvation, most of their land was signed away to settlers through treaties, and their towns were now being infringed upon by the railway. While this was happening, the Métis people were still recovering from the Red River uprising that had occurred a decade earlier. The fur trading in the Hudson’s Bay Company they had once depended on for survival was slowly phasing out. All of this, along with the expansion of the Canadian Pacific Railway into Regina and Calgary in the early 1880s, led to an upset against the government that culminated in the 1885 Rebellion. In 1884, the Métis in Saskatchewan brought Métis leader Louis Riel back to Canada from exile. Riel urged all people in the North-West to unite against Macdonald’s government, and soon the rebellion was born. Wanting to end this rebellion, Macdonald decided he would use its leaders as a cautionary example for anyone else who wished to defy him. He used the full force of Canada’s militia to defeat them, and sentenced Riel to hang. He also publicly executed a mass of Cree warriors. Our justice system has continuously failed Indigenous communities in recent years, with everything from the Sureté du Quebec’s treatment of women in Val D’Or to the more recent Colten Boushie verdict. I am in no way saying that Macdonald is the sole cause of all the harm brought to Indigenous peoples, nor am I saying that he was the only racist person of his time. I am also not suggesting that our history books and monuments should completely erase Macdonald from existence. But if we don’t want to be complicit in his actions, then we need to remember him for all he’s done—and that includes remembering him for his genocidal actions.